The Soleus 30 pint dehumidifier (DP1-30-03) is a smaller capacity, Energy Star compliant dehumidifier suitable for use in a room up to 200 sq ft (manufacturer's recommendation). It is designed to operate in a single room so if you have a space which is particularly prone to condensation, and maybe mold growth, this machine would be a suitable choice. This is a portable machine with a carrying handle and caster wheels for easy movement. It is small, weighs 33 lbs and is reasonably compact although not exceptionally so for a dehumidifier in this class. The Soleus 30 pint dehumidifier incorporates an adjustable humidistat with which your preferred level of relative humidity (RH) can be pre-set. This device works in a similar way to a thermostat to maintain a given level of RH rather than heat. Once the pre-set level is achieved the dehumidifier will switch off, cycling on and off thereafter to maintain your pre-set RH. This is an energy saving feature as it reduces the hours during which the appliance is operating. This feature also prevents RH dropping to a level so low that it would be uncomfortable for people and possibly damaging to materials, such as wood and leather, which can deform and crack if their water content falls too low. 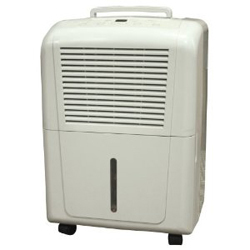 The Soleus 30 pint dehumidifier is also equipped with an auto-defrost function. Because the water is extracted from the air by condensing water vapour onto metal coils the coils have to be kept very cold. They are called refrigeration coils and are similar to those in a domestic refrigerator. Ice can form on these coils at temperatures from 65°F downwards and when ice forms the machine has to stop working until it melts. Auto-defrost actively defrosts the coils with hot air and reduces periods of non-operation to a minimum. This means that the dehumidifier is able to operate in lower temperatures, in this case as low as 40°F. If the temperature in your home falls below 65, or you wish to dehumidify a cooler area, such as a basement, auto-defrost is essential. A facility to allow continuous drainage is built into the Soleus 30 pint dehumidifier. Water collection containers, buckets, are pretty small on dehumidifiers to keep the overall size of the appliance within reasonable limits. They fill up quickly and have to be emptied once or twice a day which can be annoying. Continuous drainage allows a small plastic hose to be attached to the dehumidifier to discharge the water into a nearby drain or other outlet. This removes the need for regular bucket emptying. The water feeds through the pipe using the force of gravity so it may be necessary to raise the dehumidifier a foot or two to make it work effectively. If this isn't possible a separate condensate pump would be required to "push" the water up to the outlet. Additional features of the Soleus 30 pint dehumidifier include three fan speeds, a shut-off timer which can be set for 2 or 4 hours and auto-restart to ensure the machine starts operating again following a power cut. Consumer reaction is mixed. Some are very pleased with their purchase, others have had difficulties with the appliance and varying views about after-sales service. A third group appear dissatisfied because they had bought a dehumidifier that was insufficiently powerful for the job.